1. A periodical published by Leopold Löw at Leipsic in 1844 with the subtitle "Blätter für Israelitisch-Ungarische Angelegenheiten." It was an octavo containing sixty-four pages, including four introductory ones. 2. A periodical devoted to Jewish theology, also edited and published by Leopold Löw, rabbi ofSzegedin, Hungary. It appeared at Szegedin from 1858 to 1867, covering ten volumes. Its form and subtitle underwent various changes: the first thee volumes were in octavo; the last seven, in quarto. The subtitle was at first "Monatsschrift für Jüdische Theologie"; in the third volume it reads "Zeitschrift," etc. 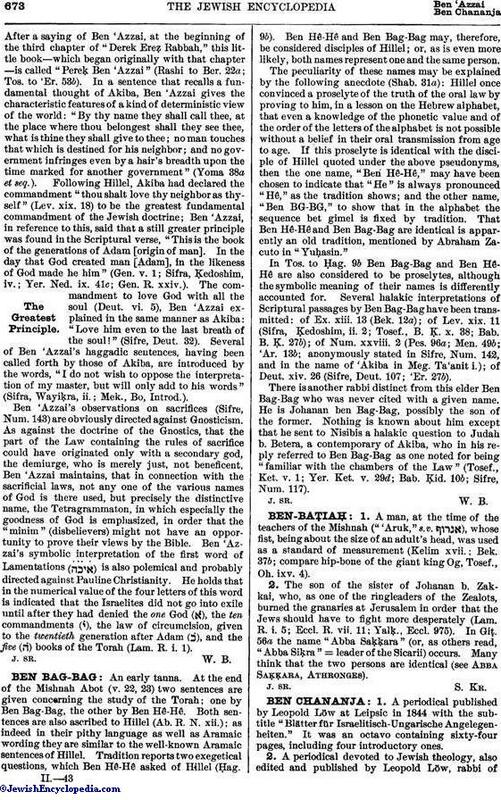 ; from the fourth to the ninth, "Wochenblatt," etc., and from the thirty-eighth number of the ninth volume to the end of the tenth, "Zeitschrift für Jüdische Theologie und für Jüd. Leben in Gemeinde, Synagoge, und Schule." The ten volumes of this journal contain important information concerning the history of the Jews in Hungary during the period of its existence, especially in relation to the Reform movement, in which its editor was heartily interested. Two supplements containing valuable contributions by eminent scholars appeared occasionally from 1866 to 1867. The one, a homiletic review, was entitled "Homiletische und Didaktische Beilage"; the other, for special scientific research, bore the title "Forschungen des Wissenschaftlich-Talmudischen Vereins." A separate treatise, "Der Judeneid Betrachtet vom Mosaisch-Religiösem und Humanitärem Standpunkte," by I. C. Soppron, was attached to vol. vii. An index to both supplements was prefixed to the tenth volume. Among notable contributors were N. Brüll, Carmoly, Criezenach, Dukes, Jost, Kohut, Munk, Neubauer, and other able scholars. 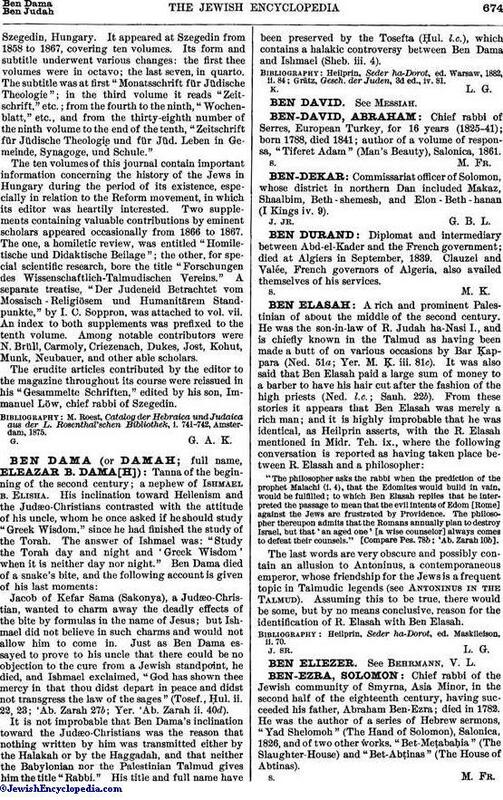 The erudite articles contributed by the editor to the magazine throughout its course were reissued in his "Gesammelte Schriften," edited by his son, Immanuel Löw, chief rabbi of Szegedin. M. Roest, Catalog der Hebraica und Judaica aus der L. Rosenthal'schen Bibliothek, i. 741-742, Amsterdam, 1875.